Cutting-edge research is a core function of the University of Kent’s Business School. Now, it has secured almost £300,000 of funding from a UK Government research fund. The Government’s Global Challenges Research Fund (GCRF), Cities and Infrastructure programme was set up to support advanced research projects that address the challenges faced by developing countries across the globe. The successful proposal submitted by Dr Maria Paola Scaparra, Reader in Management Science and the Head of the Management Science Group at Kent Business School, makes the University one of a handful of recipients of funding from the GCRF’s Cities and Infrastructure programme. This significant monetary input will enable the Kent Business School and wider University of Kent to be part of a huge global initiative which is seeking to improve the lives of those living in cities within developing countries. Find out more and see updates on the project website. 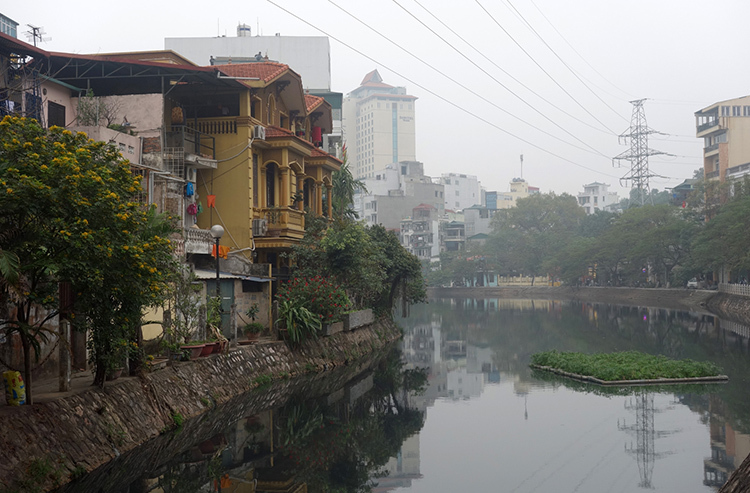 In order to secure this significant research funding, Kent Business School’s Dr Maria Paola Scaparra had to complete a detailed bid proposal, demonstrating how her project “Optimizing investment to minimize flood impact on Vietnam’s urban transport” would offer practical and workable solutions to a problem facing the developing world. She chose to focus on flooding in Vietnam – a country regularly beset by major flood events – and how optimal investment strategies could minimise flood impact on road infrastructure. Thanks to strong links with a network of local authorities, NGOs, researchers and local communities in the country, and with special focus on Hanoi, the funding will enable Dr Scaparra and her team to create new infrastructure investment plans, inform policy making and ‘on the ground’ implementation. The GCRF is a £1.5 billion fund from the UK Government that supports academic and inter-disciplinary research to address the myriad issues and challenges facing developing countries. It brings together researchers from numerous fields including social sciences, humanities, engineering and natural sciences to create problem-focussed solutions in order to create cities more resilient to fragile environments and conflict. Planning resilience for large, dispersed and largely unplanned cities by bringing together people and organisations. People making use of the city itself and the knowledge of its (often vulnerable and deprived) inhabitants to support resilience. Infrastructure in cities in the global south is often unregulated, underfunded and unfit for purpose, yet it has a huge impact on people’s lives; practical ways of improving it are needed. Habitat is central to resilience, with everything from emissions to urban planning and architecture affecting people’s lives and requiring forms of regulation. Find out more about the work Dr Scaparra will be undertaking through the Operational Research Vietnam Facebook page and Twitter feed. Dr Scaparra is a Reader in Management Science and the Head of the Management Science Group. She moved to Kent Business School from the University of California in 2004 and has an M.Sc. in Engineering-Economic Systems and Operations Research from Stanford University, and a Ph.D. in Mathematics Applied to Economic Decisions from the University of Pisa.